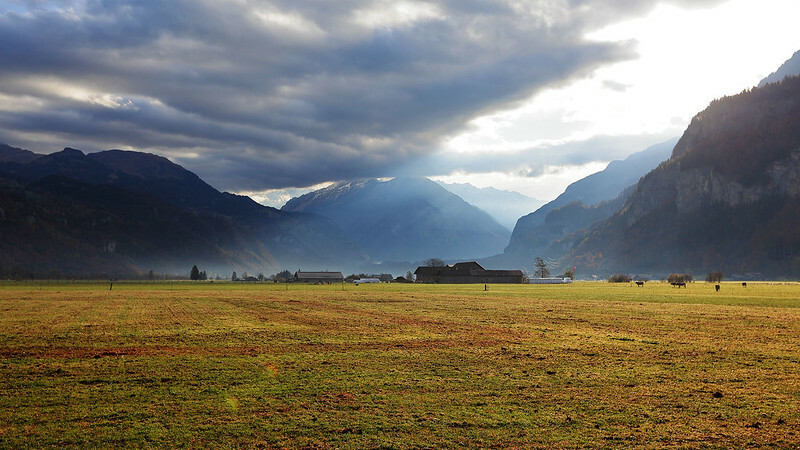 The initial part of the drive was on a main road east out of Interlaken, along the southern shore of the Brienzersee. 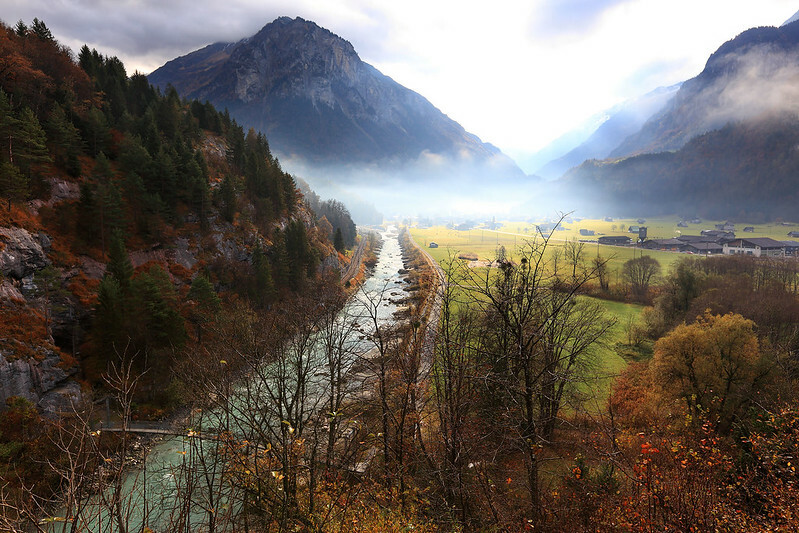 After a while we turned on to a smaller road, which wound its way into the heart of the Alps along the valley of the Aare River. 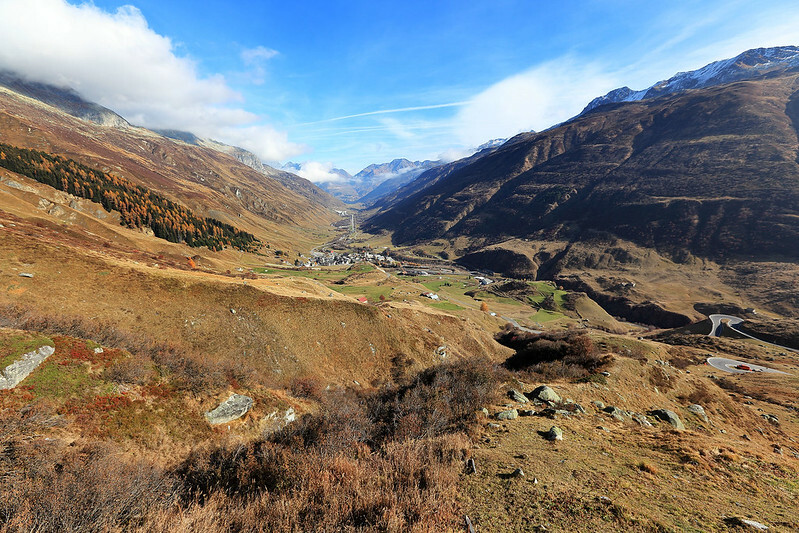 Heading towards the town of Meiringen, we passed along a broad valley with a flat bottom containing farmland. We pulled off the road into what looked like a small farm equipment business or something, because they had a large area where we could park easily. Then I got out to take some photos of the beautiful valley, wandering around the business property, as workmen were busy driving trucks or doing whatever. Some of them glanced at me, but nobody seemed bothered by my presence or asked me what I was doing. I found out later this stop was not far from the Meiringen Airport, a single airstrip just far enough away to remain hidden as I took my photos. Back in the car, we continued, past Meiringen. 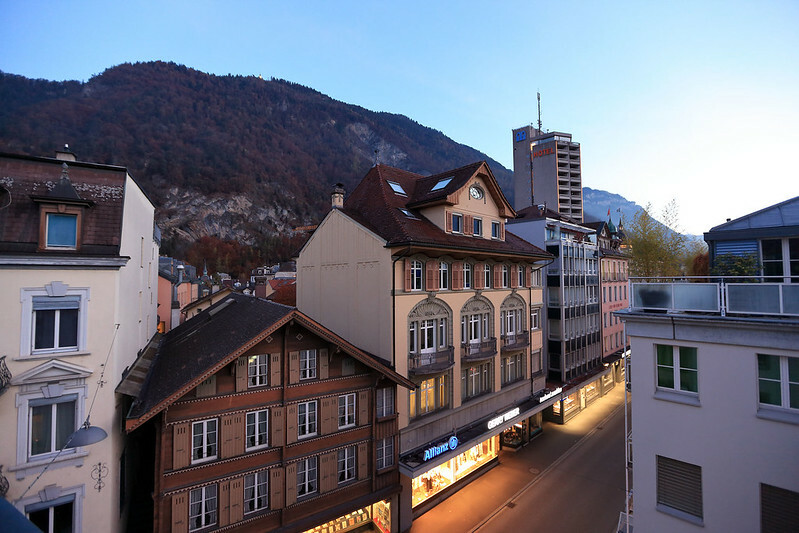 We didn’t realise it at the time, or we would have stopped to have a look, but Meiringen is very close to the famous Reichenbach Falls, where Sherlock Holmes and Moriarty had their famous fictional showdown. The road we drove on passed within about 500 metres of the falls, and we didn’t even realise it! Instead, we continued on, heading towards the village of Innertkirchen. About halfway there from Meiringen there was a steep series of switchbacks descending a hill overlooking the Aare River, which afforded a magnificent view of the valley stretching out ahead. There was still a light mist about the mountains in the distance, since it was still mid-morning. After stopping on the switchbacks to take some photos, we continued on, passing through Innertkirchen and then continuing as the road turned more southerly, following the valley fo the Aare higher into the mountains. 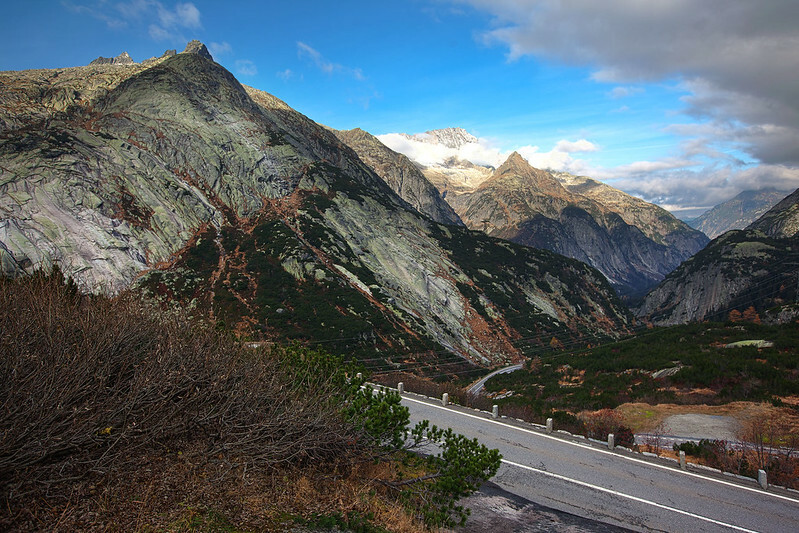 This was very scenic, as the road climbed up a long valley, occasionally making incredibly tight switchback turns, towards Grimsel Pass. The valley was beautiful, with the trees changing colour and the backdrop of the high mountains above. As we drove south into Grimsel Pass, higher and higher mountains appeared, until eventually we were amongst peaks capped with snow. Near the top of the valley was a series of small dams, stepping their way up the slope, presumably to capture water for power generation, as evidenced by transmission lines crossing the valley. Here there were small patches of snow and ice hiding in places where the sun couldn’t reach, but for the most part the ground around us was clear, with snow only visible on the mountain peaks above. Crossing Grimsel Pass at the top of this long valley, we descended a steep series of switchbacks to a stream below and the hamlet of Gletsch. This was where the road branched, with the one we were following continuing south, while to the left was the turnoff for the Furka Pass. 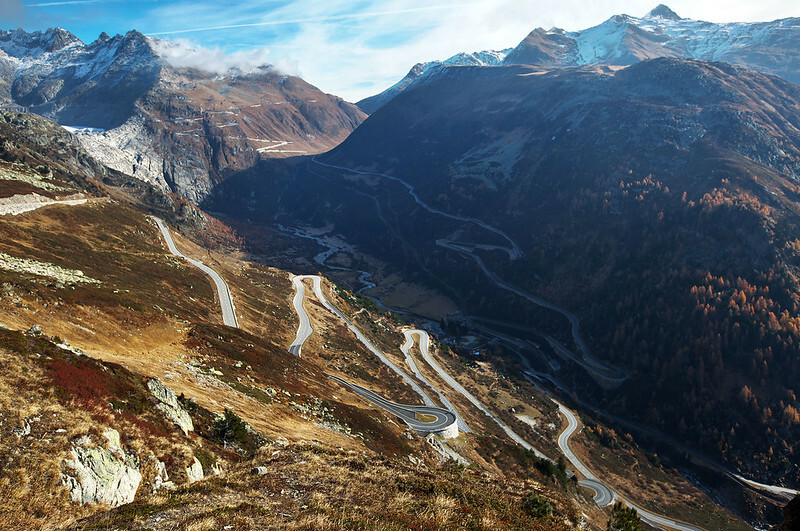 We could see the initial part of the Furka Pass road ascending an even steeper series of switchbacks up the mountain wall to our left. We didn’t quite realise it at the time, but this seemed to be the area where the scene in Goldfinger was filmed, where Tilly Masterton tried to kill Goldfinger and nearly shot James Bond instead. We made the turn to climb the mountain, stopping a few times for the scenic view and to take photos. In hindsight, we probably stopped right near the spot where Goldfinger is seen standing in the scene from the film, but didn’t realise it at the time. Unfortunately we didn’t bother stopping higher up to see the view from James Bond’s position. The pass road climbed to its highest point fairly quickly from where we began. We stopped at the peak altitude of 2436 metres to admire the view in both directions. Even here there was virtually no snow anywhere on the ground, though I did pass a puddle in the carpark that was frozen solid. The air was very cold, but it had been worse near the top of the first valley where the dams were, as there there had been a strong wind which made the cold much worse. The remainder of the Furka Pass was relatively less spectacular, but still provided some marvellous views as we descended the valley. 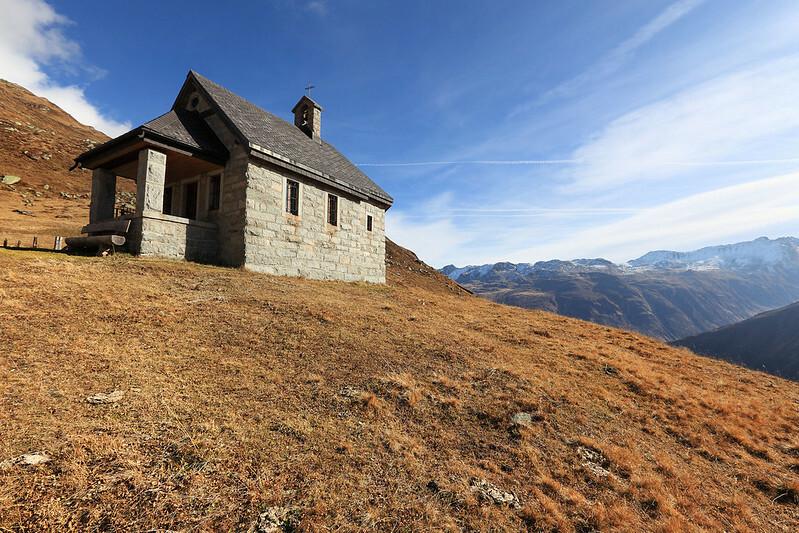 A bit further along we stopped at Hotel Tiefenbach, which had a tiny one-room church nearby, perched high above the valley with a glorious view. Partway along the valley was the small town of Realp, where we stopped when M. spotted a “WC” sign. What we hadn’t spotted was that the toilet was in a tiny hole in the wall “restaurant” – which looked more like a guy with a coffee machine and a sandwich press operating out of the front room of his house than anything else. The man explained to us in German that for non customers the toilet cost CHF1.50. So we handed over three francs and used his facilities, which were accessed through a dim garage which seemed to contain farm equipment, and situated next to a large propane tank that emitted gas fumes. Apart from these bizarre surrounding, the toilet was kept clean and tidy, so it was good to relieve ourselves before continuing our drive. At the bottom of the Furka Pass valley we rejoined the larger Gothard Pass road heading south through the Alps, towards Lugano just before the Swiss border and Como in Italy. The first town we hit in this Italian part of Switzerland was Airolo, where we stopped to get some lunch. A lot of places were closed as we drove through the main street, but M. spotted a pasticceria that had people sitting inside, so we turned into an underground car park for a nearby supermarket and parked. We entered on level -5, as it was down a steep hill, and took the lift up to level 0, which was where the main street was. 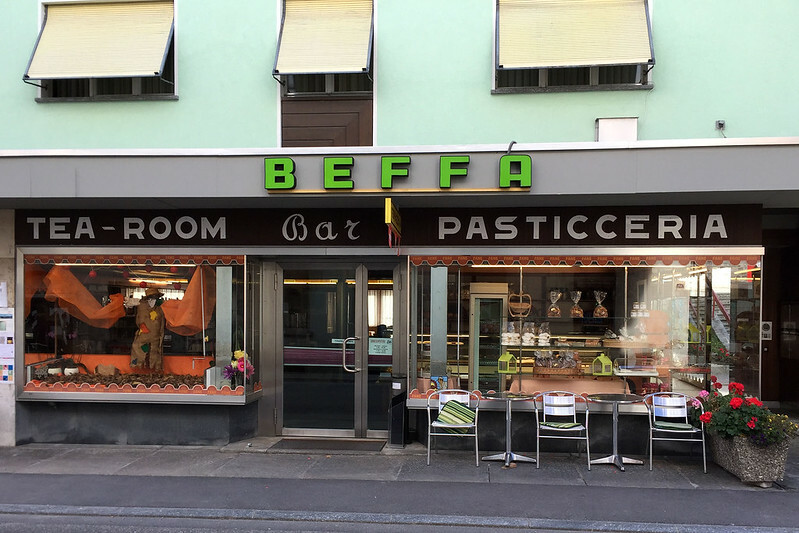 We entered Pasticceria Beffa and looked at the offerings, which were a bit sparse and mostly restricted to cakes and pastries. I explained in Italian to the young lady behind the counter, who appeared to speak no English, that we wanted lunch, and she said she could make panini for us. I asked for cheese and tomato for M., explaining she was vegetarian, and M. interjected and asked for “salade”, which the woman understood. I got a sandwich with prosciutto and cheese, and M.’s came with cheese and lettuce. I only realised later I’d been using the French “tomate” instead of the Italian “pomodoro”, so it’s no wonder she didn’t understand I was asking for tomato. We sat at a small table in the cafe section, and also got some sweets, a large round biscuit with a spot of jam in the middle for M., and a vanilla slice (or mille-foglie) for me. M. also got a cappuccino, which was made by a grey haired old lady who seemed to be shaking her head that someone would order a cappuccino after midday. As we ate, a couple of older men sat at another table drinking coffees and chatting in Italian. When we finished eating, we continued on the road south towards Lugano. There was a motorway running alongside down the valley, but we avoided getting on it so we could take our time and enjoy the scenery. We drove with only a couple of stops to take quick photos. One place I pulled the car over into seemed to be some sort of workshop where men were driving trucks in and out. I just parked next to another car and got out and wandered around with my camera, taking photos of the valley and the nearby cows, and the men didn’t give me a second glance the whole time. 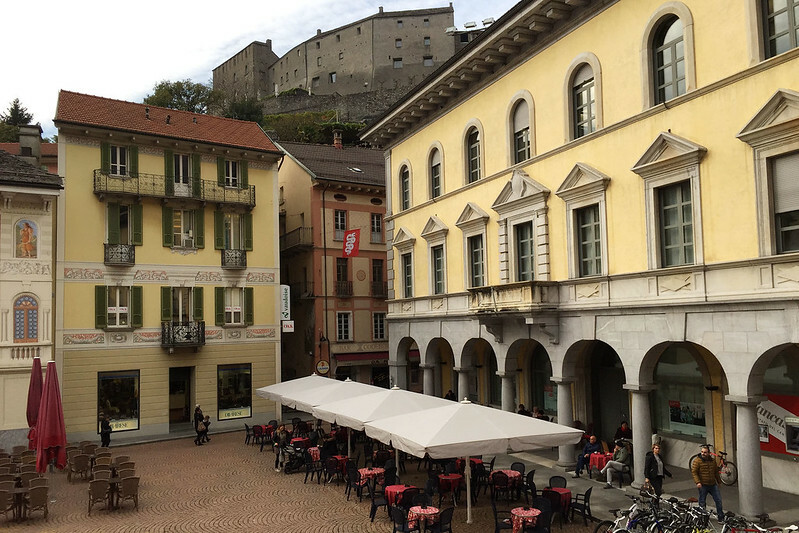 Our next stop to stretch our legs a bit was the town of Bellinzona. 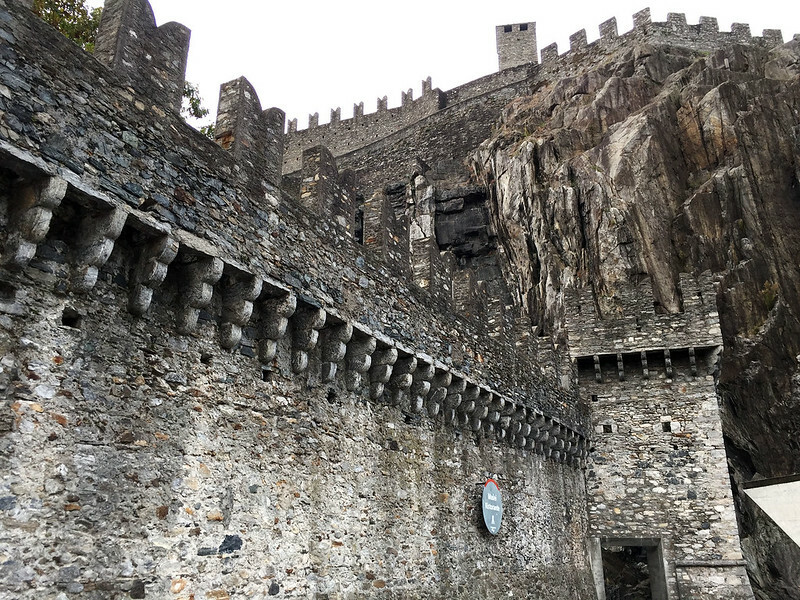 We drove into an underground car park in the centre of town and emerged to find ourselves in a piazza with an old castle looming over it from atop a rock cliff. We walked away from it, in the direction of some shops, to try to find toilets, and saw another castle nestled on a hill in the other direction! It was quite a beautiful setting, with the surrounding hills and mountains in the distance, and these ancient castles so close. I spotted a department store and suggested we try in there for toilets. It was a small store, squashed into two adjoining historical buildings. We found toilets up on the first floor, then wandered back out to explore the area a little more. Before heading back to the car, we took a look at the castle perched right above the piazza, following signs into a tunnel dug into the rock, which led us to a lift. This took us up quite a long way judging by the length of the ride. 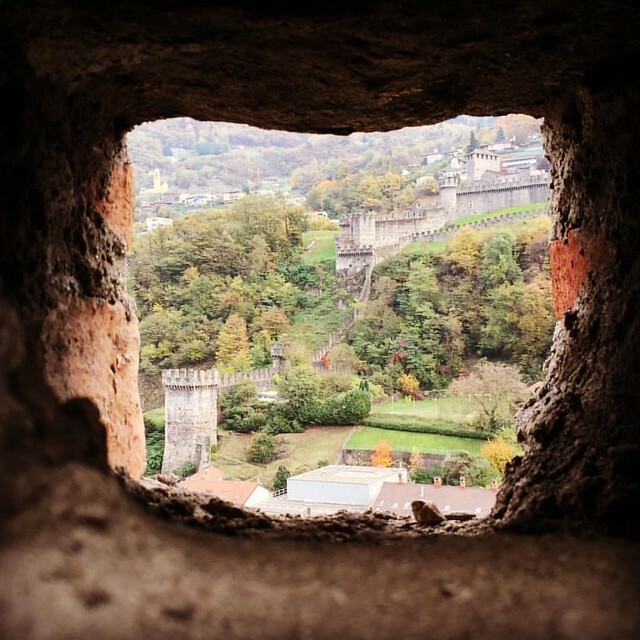 We emerged into an area where a sloping stone path took us up beside a crenellated wall with archery holes in it. Towards the top we could look out over the wall to see over the town below. Turning a corner led us into a grassed courtyard area, surrounded by stone walls, and with a couple of square towers. We didn’t stay too long to explore further, as we wanted to hit the road again, but it was well worth the few minutes we spent to check out this castle. In the car, we decided to stop short of Como and spend the night in Lugano instead, giving us one more night in Switzerland. As we drove into Lugano, towards the centre of the city, we spotted a hotel by the side of the road that didn’t look too expensive judging from the age and style of the building we could see. So I pulled in, which involved crossing a pair of railway lines at a level crossing and then driving up a sloping cobbled driveway. We parked the car in an empty spot near the front of the hotel building, and got out to find reception and inquire about a room. It was then that we noticed that the hotel was not just the modest building we’d spotted from the road, but adjacent to it was a much bigger and grander looking building, in an old imperial style of architecture, with wrought iron balconies and green shuttered windows. We realised the reception was in there, and that both buildings were part of the hotel property. This was the Continental Parkhotel, and the rooms turned out to considerably more expensive than we usually pay for hotel rooms. We chose the cheapest option, which was in the new annex building that we’d originally seen. This had the disadvantages of no views, and being immediately adjacent to the train line, although the reception lady told us the rooms were soundproofed, mostly. This didn’t really bother us since we’re used to train noises at home. The lady at reception also gave us a map showing how to walk down the hill to the old city area. M. asked if she knew of any restaurants where we could get rösti for dinner, and she thought for a minute then gave us the name of one. Before dinner however, she suggested we take advantage of happy hour in the hotel bar, which was half price drinks between 17:00 and 18:00. M. thought it would be good to sit in the bar and catch up on writing this diary, rather than sit in the hotel room, so we dropped our bags in the room and went across to the older building where the bar was. Another woman there served us drinks. 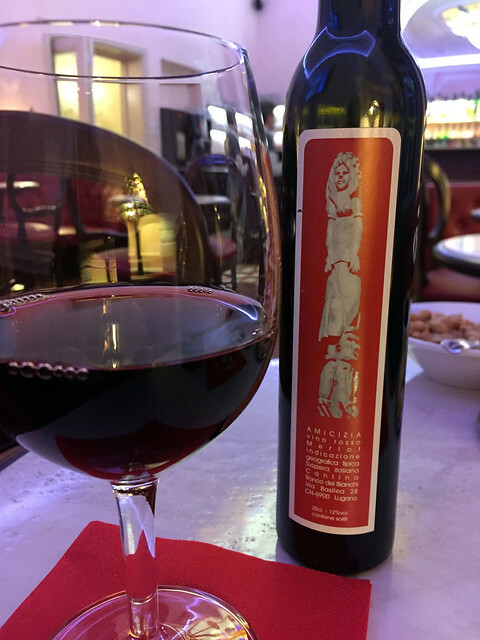 She said that the wine was made by the owner of the hotel. M. chose an “Amicizia” Merlot, which didn’t come by the glass, but did come in small 250 ml bottles, which the lady said was “two glasses”. It turned out to be more like three. I tried an Einsiedler Alpenbier, which was fairly light and fruity. With the drinks, the lady brought over a selection of snacks: hot meatballs, peanuts, small chunks of gran padano cheese, and red currants. Given the half price discount on the drinks and all this free food, this wasn’t bad value at all. We stayed in the bar until about 18:30, then went back to our room briefly to prepare to head out for dinner. We took the suggested walking route down to the old town, which involved walking down some steeply sloping streets that were, against all logic, two-way traffic despite being barely wide enough for one car. We took some stairs next to a large church that was apparently under renovation, then continued down more steep streets, cobblestoned and lined with shallow steps on each side. When we finally reached a flat area, we found the restaurant that the hotel receptionist had recommended, but the menu outside didn’t mention rösti at all. They had lots of risotto dishes though. So we explored the narrow streets of the old city, looking for restaurants that had rösti on the menu. After several failed attempts turned up only places serving pizza and pasta and maybe some other Italian dishes, we finally located one place that had “rösti con porcini”. This was a bit weird, and possibly some sort of Swiss-German-Italian fusion dish. We were hoping for rösti with cheese or egg or something. So we kept looking, and found another restaurant that also did rösti con porcini! We figured this was the best we were going to get, so went in and got a table. Being our last night in Switzerland, we wanted to have the traditional Swiss dish, but M. wasn’t keen on the porcini mushrooms. So I asked the waitress if it was possible to have the rösti with cheese instead of mushrooms. She said yes, so we ordered one like that for M. and one with the porcini for me. While we waited, the waitress brought out a brown paper bag with chunks of bread in it. I tried one, but it was hard and stale. And then the rösti arrived. Rather than being the rustic hand made dish we expected, each of our plates contained what looked like two commercially made hash brown patties, perfectly circular and cylindrical. Mine was smothered in sautéed porcini mushroom pieces, while M.’s had what looked like mozzarella cheese melted on top. 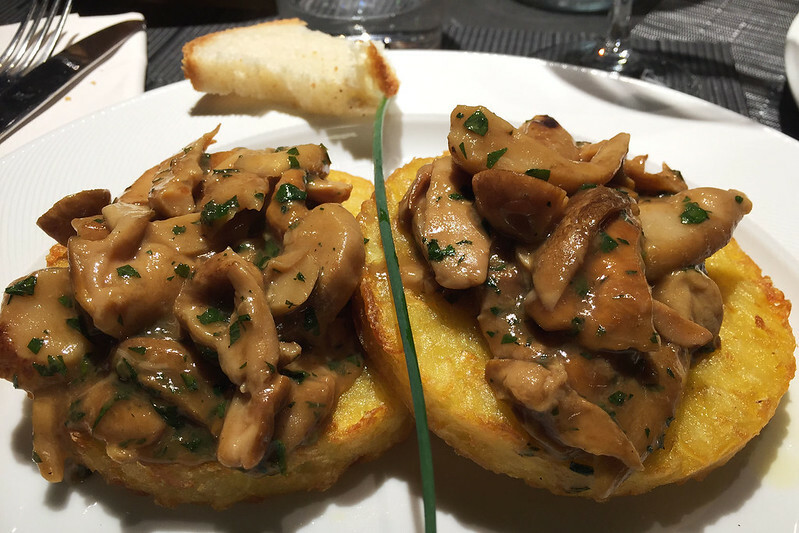 The mushrooms were nice, but the pre-made rösti really spoiled the meal experience somewhat. I guess that’s what we get for ordering a Swiss-German speciality in Swiss-Italian country. While we ate, a fire engine pulled up right outside the window near us, and fire fighters rushed into a building across the street. It must have been a false alarm though, as they soon packed up and left. Sitting at the next table to us was a family with two kids, a boy and a girl. They ate pizza while their parents had entrees, but then had finished eating by the time the parents’ main meals arrived, so the waitress gave them paper and coloured pencils to draw with. When our dinner was done, we walked back up the hill and across the train tracks to our hotel. We had to wait a few minutes to cross the tracks, because the barriers were closed and lights were flashing when we got there, but no actual train passed through the crossing for several minutes. Once across, it was quickly into our room and ready for sleep. Addendum: We later learnt that both the Grimsel Pass closed for the winter due to snow from 7 November, just 5 days after we drove through it (the day we drove from Cuneo to Monaco later in this trip). 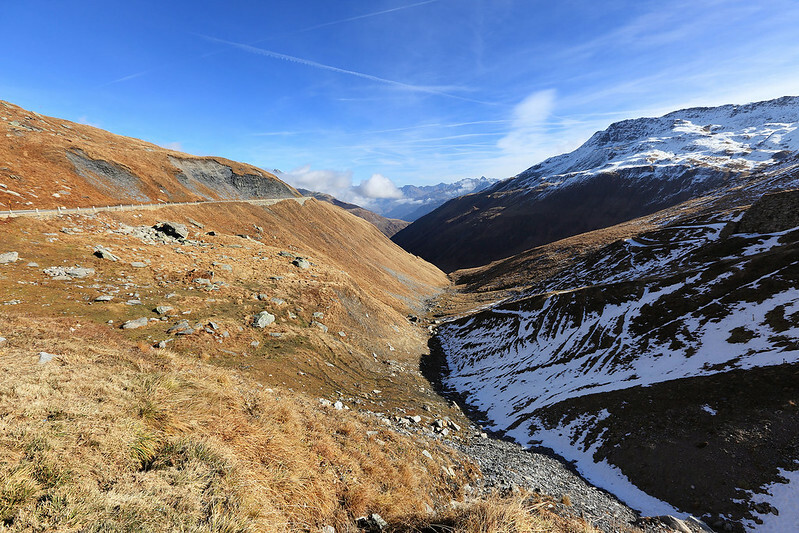 The Furka Pass and the Gothard Pass between Andermatt and Airolo both closed for the winter due to snow from 11 November (the day we left Nice later in the trip). This entry was posted on Thursday, 23 March, 2017 at 17:13	and is filed under Diary. You can follow any responses to this entry through the RSS 2.0 feed. You can skip to the end and leave a response. Pinging is currently not allowed.